Strawberry Lodge is an historic Pony Express stop that features an affordable lodge, motel, restaurant, bar, banquet and wedding facilities. With rooms starting at $49 a night we are the right choice if you would like to be close to Lake Tahoe, Gambling, Rock Climbing, Lover's Leap, Fishing and/or The American River! As an added bonus, we also accept dogs! Located in Kyburz, CA we are about 30 minutes from Placerville and 20 minutes from Lake Tahoe. Lover's Leap can be seen from rooms that also view the American River. Guests are welcomed daily for breakfast, lunch, dinner or for an overnight stay in our stone and log building set in the beautiful Sierra Nevada’s – close to skiing, gambling, rock climbing, bicycling, rafting and fishing. Enjoy crackling fires, food, wine & spirits in our quaint lodge nestled at the foot of Lover’s Leap, a location that entices rock climbers, hikers and visitors from near & far. Walk in our garden bordering the American river & gaze up at the awe inspiring granite peaks. The exceptional views and serene ambiance in our little “Yosemite” has been and continues to be superb location for vacationers. Begin your visit delving into local attractions and events then decide upon the best adventure for you, your friends and family. Hiking to Horsetail falls, taking boat rides across Echo Lake, traversing wild flower trails in Desolation wilderness, or climbing Lover’s Leap are a few of the many options available. You may opt to adventure forth on our online orientation tour that will offer you a glimpse of the spectacular sites surrounding our historic lodge. 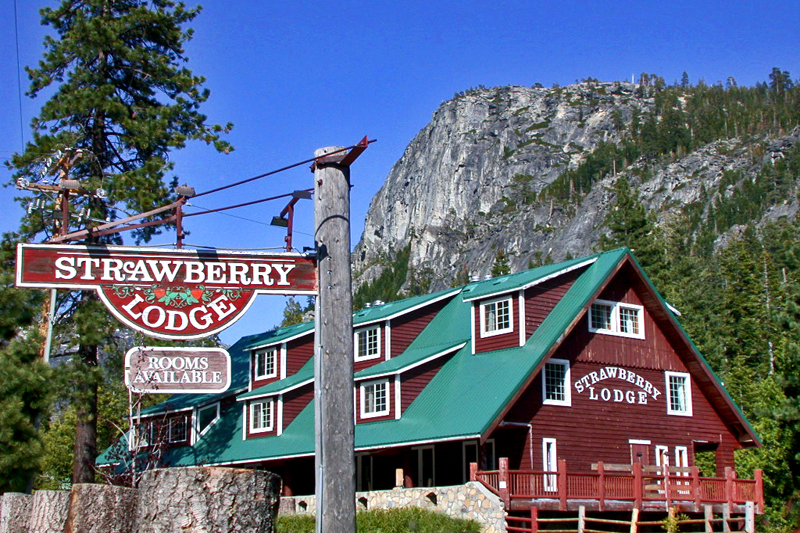 Spending the night at the picturesque Strawberry lodge, famous resting spot for Pony Express Riders, is like stepping back in time 150 years. Historic photos line hallways that transport you back in time. The tranquil setting and historic grace of our lodge enables guests to unwind and recharge. Enjoy falling asleep listening to the whistling winds, serene waters or simply savor the gentle calm that snowy evenings create. While visiting, feel free to sit in our garden where you can enjoy the calming sounds of the South Fork of the American River, indulge in a picnic from our famed restaurant or and relax at the river’s edge on rustic benches and picnic tables. Inhale the fresh air, gaze at majestic peaks and absorb the breath taking scenery. Those eager for a mini getaway can access Lake Tahoe 20 miles up Highway 50 where you may take a drive around Lake Tahoe, hike in Emerald bay, listen to Camp Richardson music, cycle on bike paths or kayak on the crystal-clear Tahoe waters. Upon your return, feel free to relax in our creek-side garden with a glass of wine or cold beer. Enjoy the tranquil American River and sit at the river’s edge on rustic benches or picnic tables. Inhale the Sierra fresh air, gaze at towering peaks & absorb the breath taking scenery!